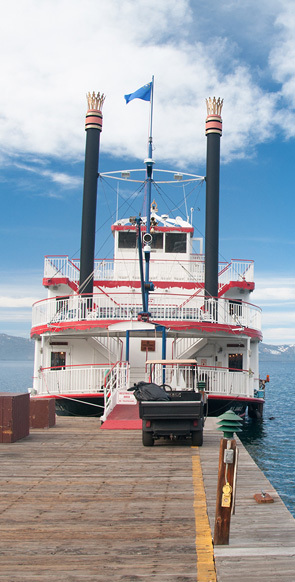 Modern Lake Tahoe history could be said to begin with the lake's "discovery" by Captain John C. Fremont. With Kit Carson as his guide, Fremont first saw the lake from Carson Pass February of 1844. Of course, the indigenous Washoe tribe's territory surrounded the lake. In fact, the name "Tahoe" is an English mispronunciation and evolution of their name for the lake translated as "edge of lake." Over the years other names were applied to the lake, with considerable controversy, until Lake Tahoe was finally adopted officially in 1945. In the 1850's the California Gold Rush and other attractions resulted in heavy wagon train traffic through what is now known as Highway 50. Then, wagon traffic was so heavy the route was called the Roaring Road. Today Highway 50, passing over Echo Summit, is the preferred route for visitors driving from Sacramento or the Bay Area to South Lake Tahoe. Interstate 80 is the more direct route taken to Donner Pass, Truckee, and the ski areas west of the lake. In 1858 the Comstock Lode, a silver strike in Virginia City, Nevada, just 24 miles east of the lake, brought miners to the area. Much of the forest surrounding the lake was logged for use in and around the mines between 1858 and 1890. Tahoe City was founded in 1864 and soon became a resort community and recreational destination, primarily for miners from Virginia City. It was the beginning of Lake Tahoe development which continues apace today. For the first half of the 20th century Lake Tahoe development consisted of vacation homes built by the rich. Vikingsholm Castle, Ehrman Mansion, Thunderbird Lodge, and the Tallac Resort, are some of the better known historic sites from this era. The middle class discovered the lake in the 1920's, casinos began opening on the Nevada side of the lake in the 1940's, and ski resorts began appearing in earnest in the 1950's. The Winter Olympics were held in Squaw Valley in 1960, resulting in a building boom encouraged by the completion of the four lane I-80. In 1968 the Tahoe Regional Planning Agency was formed to ensure that ongoing development preserved the principal attractions of the region, all of which depend on the health of the natural environment. In the 1980's and 1990's building continued at a more controlled pace. The 21st century finds the Lake Tahoe Basin to be a combination of recreational, commercial, and residential areas surrounded by magnificent wilderness. Traffic jams are not infrequent in the towns around the lake and the main highways can become congested as well. Yet, just a few feet from the hustle and bustle the magnificent environment enfolds visitors in nature. There are state parks on all four sides of the lake as well as national forests. The beauty of the lake's arctic blue waters remains crystalline clear. And you, astute reader, have clearly discovered that the place to be for convenient access to all of the different kinds of environmental and man made attractions in the Lake Tahoe area is South Lake Tahoe. And the best combination of natural environment and convenience is clearly the 3 Peaks Resort and Beach Club. Do your part to preserve the environment by walking to all the major attractions, leaving the car safely parked at the hotel.